When I think of picnics and barbecues I think of pasta and potato salads. Something about the quintessential side dish that gets me every time. I’ve made my tried and true pasta salad year after year but wanted to spice it up recently at a barbecue. That’s when I created this recipe for Orzo Antipasto Salad. Who doesn’t love tomatoes and fresh mozzarella? Why not put it into a pasta salad? I chose orzo pasta because its light and to be honest I neglect it more often than use it. So I wanted to do something with it. 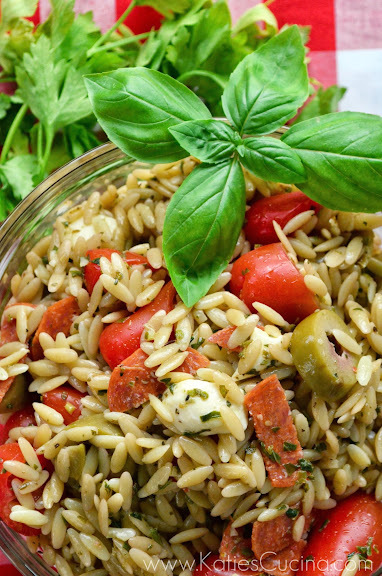 This Orzo Antipasto Salad is loaded full of fresh tomatoes, mozzarella, olives, and pepperoni! I also love pasta salads because you can make them ahead of time and nine times out of ten they only get better over time! 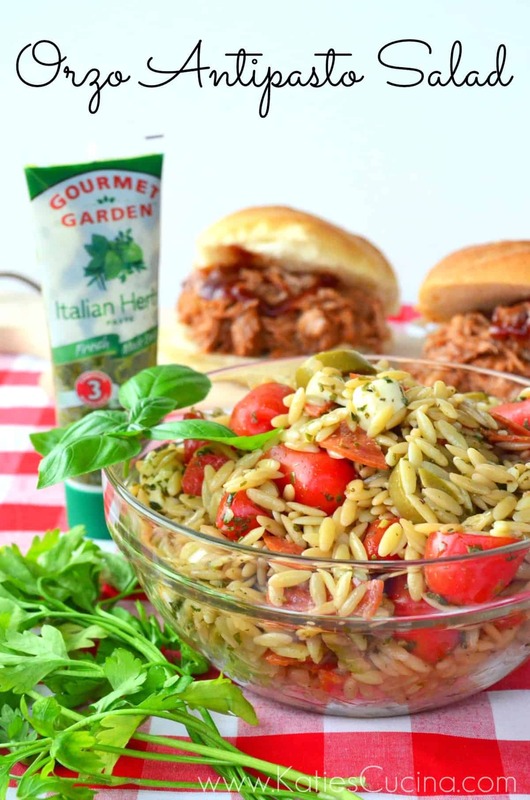 For this pasta salad I used Gourmet Garden Italian Herbs paste which made a pesto like taste throughout the pasta salad! This salad pairs beautifully with everything from burgers to pulled pork (pictured in the background). Cook pasta according to box instruction. Make sure to 1 tablespoon of salt to your pot. Drain the orzo in a colander and run under cool water until the pasta is at room temperature. Place pasta in a large container. Add to the container the 1/4 cup Gourmet Garden Italian Herbs paste, garlic paste, olive oil, mini marzano tomatoes, chopped mozzarella and olives, and pepperoni slices. Mix well until everything is incorporated. Refrigerate for 30 minutes before serving and store in a sealed container for up to 3 days. I have been dying to try those Gourmet Garden herbs! What a beautiful salad. This looks so good! I bet it would taste great with some black olives and a salty type of cheese too, like feta. Suzanne, I think a variety of chopped olives would be great! I love this recipe. It’s so wonderful. Orzo is fabulous and I love the flavours in this. The cheese just takes if over the top. Thanks Kim–I agree I love the little bites of mozzarella!